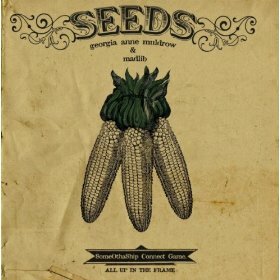 Famed beat conductor Madlib has teamed up with former Stones Throw label mate Georgia Anne Muldrow for Seeds. Having worked together on Mos Def’s The Ecstatic as well as on label projects, Muldrow is a talented producer and multi-instrumentalist in her own right. Now casting a spell of neo-soul, psychedelic and hip-hop tracks with her newest, the singer-songwriter brings a deeply spiritual, some other connect, sample-based production that includes reflective moments in the title track. With Madlib at the helm, it seems like letting someone else work the boards works well for the L.A.-based artist. “Best Love” is a must-spin.